Pen to Mahed. This day was a major departure from our usual routine. When we say ‘usual routine’, we mean our routine of the last 6 days. 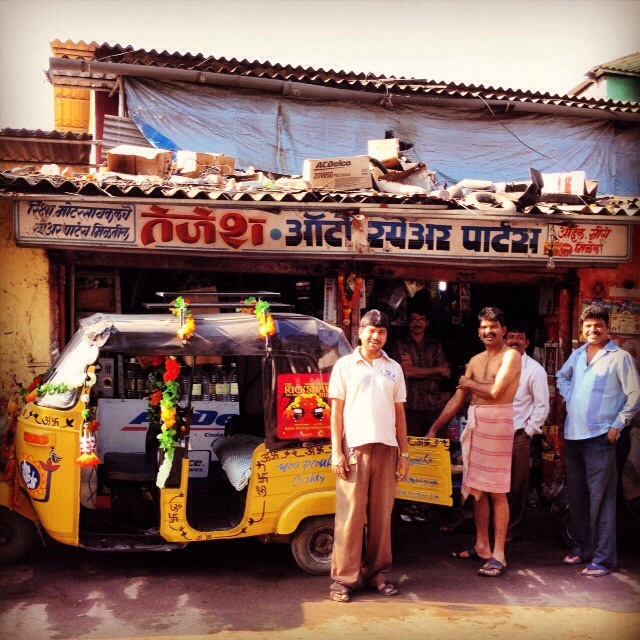 It already feels like we’ve always been driving a rickshaw across India. Our clean London flats, clean London clothes and clean London lives seem like distant memories. We wake up in the morning. 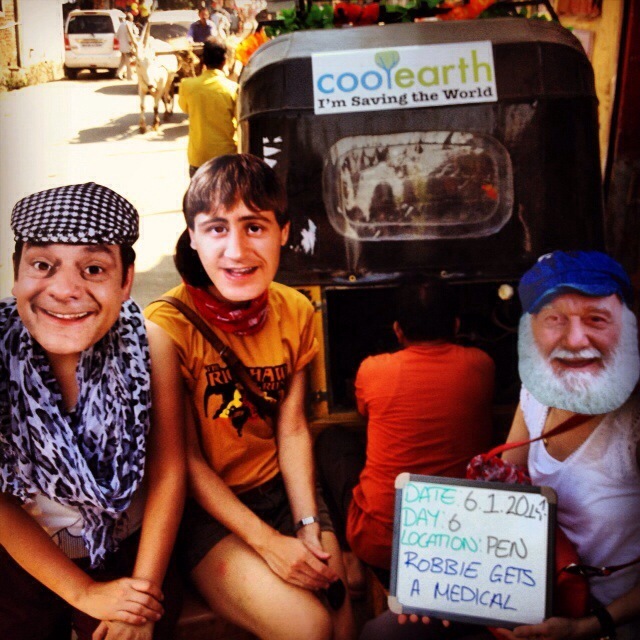 We drive a rickshaw. We sound our horn aggressively, overtake and undertake on blind corners, swerve round cows and never give way. We are Indian rickshaw drivers and our daily routine is as follows. The alarm rings at around 06:30. We’re on the road by 07:30 – 08:00. We drive for 9 – 10 hours with 10 minute breaks every hour or so. We start looking for a hotel around 17:00 and aim to be off the road by 18:00 before the sun goes down. Our typical Rickshaw Run day. Apart from today that is. Today was the day of Robbie’s service. 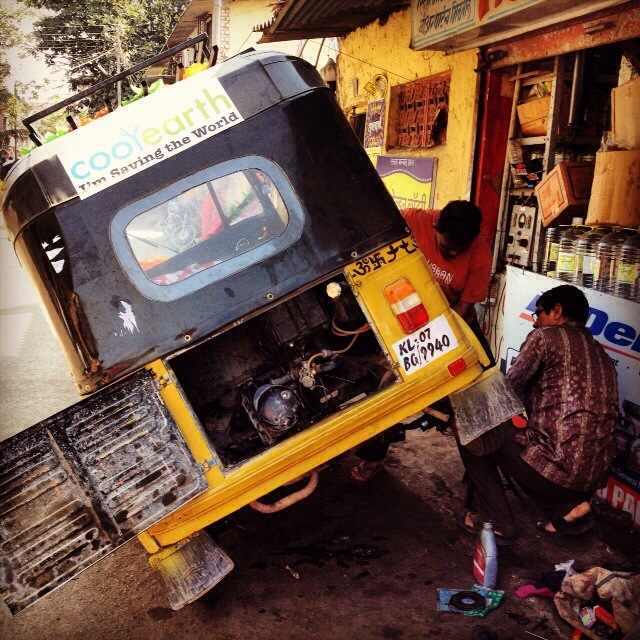 We spent 4.5 hours sitting outside a mechanic’s shop in the town of Pen as he underwent a complete overhaul. That rattling noise at 40kph? The exhaust was hanging on by a thread. Ahh. The pulling to the right when negotiating a left hand corner? His steering column was bent. Ahhh. His losing speed up hills? 3 soft tyres. Ahhhh. His unresponsive brake? 2 worn brake pads. Ahhhhh. After his rebuild, Robbie purred like a kitten. Or maybe a kitten with a chest infection. He is still only a little old rickshaw after all. All this meant that we didn’t hit the road until after 15:00. Which meant that we broke a golden Rickshaw Run rule: don’t drive at night. Robbie’s lights could barely illuminate the ground immediately in front of his own wheel, let alone the deep crevasse looming ahead. Indian drivers use only full beam which, when combined with Robbie’s badly scratched plastic windscreen, meant that Jodie in the driving seat was completely blinded 90% of the time. Claire and Erica guided her by leaning out the sides of the rickshaw and shouting ‘left a little’, ‘right a little’ and ‘TRUCK IN YOUR LANE’. At 21:30, after 2.5 terrifying hours we made it to a hotel. We had survived. We were awesome. It was an empowering exercise in team work and tenacity. But one that we will not be repeating again in a hurry. While waiting for Robbie to be serviced, the mechanic carried over his cute 3 year old daughter to say hello. The following conversation then took place between Jodie and Claire. We’re not sure why Jodie and Claire keep having these inane exchanges. Perhaps after 31 years they’ve run out of intelligent things to say to each other. Maybe they never had any. Claire: Is that a bindi or a large mole in the middle of her forehead? Claire: Why is it brown and hairy then? It’s lovely to see how this trip in India has really brought out Claire’s maternal side.